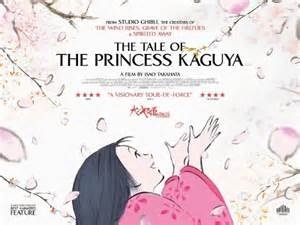 For matinees at QFT on Saturday 11 (3.25pm) and Sunday 12 April (3.15pm) the English dubbed version will replace the original Japanese with English sub-titled version shown at all other times. There will be a pre-screening talk given by Laura Shearer, Film Blogger, on Saturday 4 April at 6.00pm. This is a tale of discovery. Set a child down in front of it without them able to understand language, subtitles or the mixture of both with an English version thrown in and for two hours they will be mesmerised. Albeit very confusing to see a child grow into a juvenile, be taken from what seems like a paradise and to see them proudly develop opportunities such as skills with music they could relate to the grim Lady hired teacher of all things proper. At every opportunity Takenoko (the name meaning L’il Bamboo) refuses to be Bidden by the Lady of her parents choosing. This Governess is caught between the post and the willfulness of the child. The kids will relate to this. They may find the halting nature of the progress and attainment of happiness and may recall and miss the rural bliss left very much behind after Takenoko has become nearly woman. One part of this Japanese animation directorial dynasty is Seventy Three the other Seventy Nine. They give us a vision of indescribable Japanese culture. It assumes the form of the simplest graphic. Such that two dimensions seems a moving book opens in front of you. The sweep of a pen lovingly held just so on the page where it is not word as Kipling choosing … don’t look too good .. Watch the things you gave our life for … of the story travels. Miyazaki, who directed Spirited Away and studio’s acclaimed chief, retired last year, at 73, with his ninth and final film The Wind Rises. 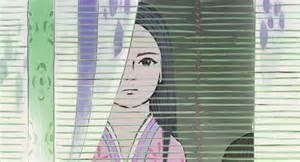 Takahata’s time at 79 do the same arrives to this extraordinary painstaking animation drawn as an exquisite allegory for Japanese minimalism which I discovered in the Japan Exhibition some decades past in the British Museum compellingly exotic. Around the same time I was considering how Yeats was drawn to No theatre and what that said about the theatre of Ireland as well as contemporary Beckett plays. Did we citizens of the world recall through minimal line and mythological thanks portrayed to a creation we so fragile hold? Yes. The escape into imagination is ours to perceive. 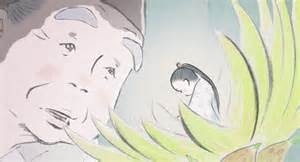 Isao Takahata the renowned Director finds here the tradition of Studio Ghibli’s animation technique as ancient scroll-painting coming to life in water painting as a fusion of air and balance of colour and line. Put over as charcoal it becomes recognition of our carbon, the human element of these sketches. The mystical properties of the story are very evident. Even in the final act. The narrative is serious and altogether on the fine line between sadness and acceptance. The charcoal emanates from the willow bamboo an internal minutiae seldom visited. The evocation of landscape also brings memory of forest smells. The willow is, I call it whittling, cut to reveal not a point but an inhabitant. Our Jonathan Swift is Lilliputian and visceral complexities – this is instead 10th century fable. Has it moral and folkish lore? Out of the bamboo the whittler finds a naid to be taken home to his family home. The Mountain from which the Bamboo is drawn has but a short time to provide and a decade is required once a harvest by the population is gathered in. Those ten yars occupy the middle segment and the Mother and Father recreate for themselves, selflessly in the midst of their new surroundings some representations of the old life. The parents are endearing and also confounded by what this peculiar world they are encouraged into developing as though given instruction from the Heavens. The children find the earth full of things which renew whereas the uh obtainable is how the wider world sets out its goals. Takenoko sets a task once the skills and assertiveness of her life takes hold. That is in order to have someone win her heart which is the dearest wish of her family and the city expects she puts out a call impossible to answer but the elitist suitors overwhelmed in expectation of the hidden love of The Princess go forth on the task. The kids have seen it all before in many a movie and cartoon. The floundering of adults in pursuit of the impossible and the inevitable volte face in failure. But is it learning and why is it the insistence of The Princess who surely knows their is that thing called love to be satiated. There the foundling becomes Takenoko who within a very short period identifies as a fully grown Princess. Discounting thus rural bucolic existence as being her real life or natural home she veins to observe otherness laying beyond this majority view of Japan. So what Japan do we see? What psychology of Japan rises above the personal? What authority of restraining the personal growth Takenoko is privy to there in the space frame of this illusory vestage of Japan’s primary pathos and art form. The format of Scroll enveloping the No dynasty of story telling in fable as religious instruction. Variously within this genre is encountered all of Japan’s life. It’s corpuscles amphibious then earthen and token pots mathematical guile as form arrested on geometry. Pots are formidable excelling art trusting in simplification as domestic, well what is it rectitude, certitude, alacrity, hubric control? That is an entire subject 73 and 79 year olds are familiar in exhausting but not running low on cabling their story driven creation of illusory cultural landscape. The pen fades out the image of landscapes as they escape from or reach to the edges of Cinematic frame. It is reduction in cerebral thinking brought to make space for another non realised or unseen presence. 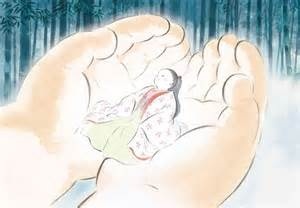 Takahata put back the child into the Princess whose rejection of the material forms advanced by city and patronage as her beauty revered and sought becomes burdensome is curated Japan in the animator a hands. Takahata requires and sees this water level tunnage. The under cut line of human the frog eye cut by a sight line we know – when we observe it split by the horizontal – it has both in mind. 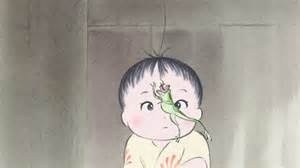 Two parts to us Takahata’s us that is here imparted through timeless skilful animation. 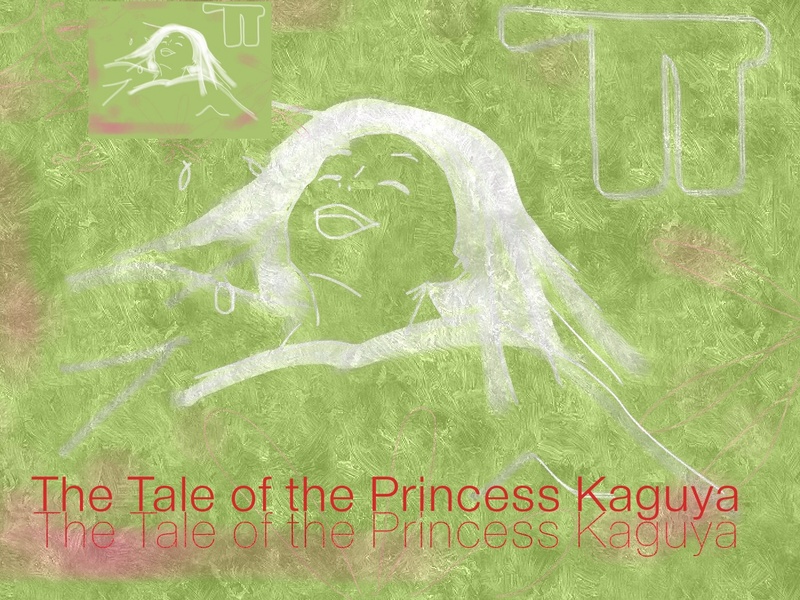 Only animation could show this flourishing as Takenoto becomes a custodian of flowers for the life makers here prescient ancient creators planting her in minutiae along with the dreams to fulfill it are not dream archers but come to retrieve the life lived once the dream has another form to return her to her true will. The return to childness forever – Buddas are Indian and the Angel’s Christian emblematic symbols some are familiar with in these allegories. I find this aspect of glory very wishy washy – all the films colour has gone – the new moon (and on 4 April 2015 a seventh appears!!!!!) is benign and over white and and primarily tiresome. The world is not only screamingly beautiful in so many contexts – not this one – we manage not to see, the image of arrows as flowers penetrating solids or what lies next to the bedrock of trolls and goblins harvested in greater and more formidable accounts. The likes of Brian Cox need do the kids a programme on this one or Matthew MaConaghy explain how he manages to traverse the wormhole or black hole of whatever it is he finds in space outside his space suit in ‘Interstellar’. Other Narnias are available as are quasi religious symbiotic attempts at national analysis fastened to cultural expression. The immersion is acceptable but without the ability to feed the senses the Japanese themselves are advantaged in staging their exploration of their gathered historical collections are we westerners ever likely to presume anything other than a cursory appreciation. It is a shape shifting movie in the sense it is splendidly harnessing a genre of which there is no equivalent. It is beautifully and evenly rendered throughout and sees us disappear for a while going along with its long depredation of a life long tale. It encompasses the entire ‘universal’ life of Takenoko – variously L’il Bamboo, the Princess of Kaguya and we spend quality time with her lovely parents. We also learn crafts never dreamt of and the axiomatic of beauty in the simplest forms of nature as well as the most complex unknowns we encounter and appear to ignore that concept of for our immediate gratification. The splendid rendering is what acts as a cohesive form and in the story is to be found many meanings some inpenetratable and some no doubt traditional faithfully held forms of expression/belief. Be careful you seek some prior story heads up if you intend to have it as children’s cartoon entertainment. Or use it to ask them what it’s all about. On at QFT from Good Friday onwards SEE QFT CALENDAR FOR EASTER CLOSING DAYS IF ANY. A SPECIAL SCREENING TAKES PLACE ON SATURDAY 4 APRIL 2015. With an introductory talk. The following is useful for kids show times though a child’s ticket price is not advertised or is it? !